Surviving Old Age: Part One. Can we talk about surviving old age? It isn’t mine I’m worried about. It’ll catch up without any help from me. I am more concerned with the herd here at Infinity Farm. We used to positively percolate with vitality and there was a dancing joie de vivre here on the windy, treeless prairie. Everyone bounded everywhere. But now the herd has aged like Baby Boomers, and most of us count our years in double digits. We still have some insolent youth around, but the old horses lean against barns meditating on sunny afternoons. There are llamas with long teeth and crooked toes; their fleeces are coarse as steel wool now. The surviving goats are officially old goats. That’s different. The dogs slowly wake up to visitors that are already in the house. And Hank, feline mass murderer of bunnies and rodents, is nearly toothless. Sometimes I wander through the herd, idly predicting which of my hips will get replaced first. It’s my personal reminder of the wondrous years we shared. And we are far from done. Do you ever do the math? When I am 70, my young mare will be 16. But who else will still be here? The herd will dwindle by attrition; we aren’t the sort to send off the elders who can no longer work. The passing of time will do that quickly enough. And so our family gets a little smaller each year. I’ve lost animals suddenly, unexpectedly before their time. It’s a wasabi sort of pain, undeniable. Hot and crisp in its bite, a slam of reality. In some ways, it’s easier than the pain of gradual erosion. The slow motion ache of watching a beloved’s life grow dimmer, just a day at a time, is more subtle, but deeper and heavier. I want to enjoy this precious time, but the future is as inevitable as gravity. I must get better at this, I always outlive them. “Old age is no place for sissies.” Bette Davis. Boy howdy, that’s for sure. I have done some brave and crazy things on horseback, but nothing will ever take more courage than watching my horses get old. For all my whining about it, and I am whining, the animals don’t seem so very concerned. After all, it’s the natural progression of things. No one wants plastic surgery or dental restoration. They accept reality and then enjoy lunch. 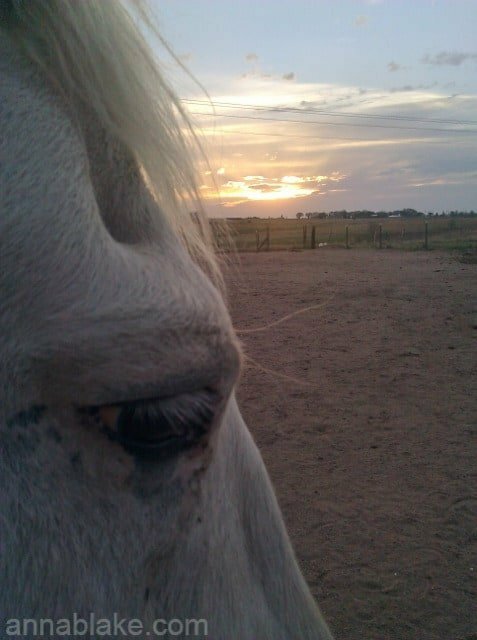 I think horses are Buddhist (and better for it.) We humans get so possessive. We think way too much. So how do we survive their old age? Well, keep breathing obviously. When it gets hard, go back to the first commandment of the Church of Dressage: Relaxed and Forward. In the saddle or on the ground, it makes most things easier. And then, if all else fails, maybe a puppy. We all agree with you about lunch. Thank you. ‘It’s a wasabi sort of pain’ great image..how the heck did you come up with that? Linda, you know… and I think I have seen that wasabi (blow the back of your head off) look on you once or twice, my dear friend. Linda asked my question. Great sensory image! And I hadn’t reached the bottom of your post yet when I decided I was going to comment “Time for a puppy!” but you beat me to that! I believe in relaxed and forward, and I believe in young blood to make us stop counting for a while. They come into our lives and they train us and teach us and remind us that whether we have fur, or hooves, or beaks, we are all travelers on the same path. Ah, Anna, I’ve been feeling somewhat the same lately and partly it may be because we’ve both recently lost one of our particularly close companions (though, of course, each and every one is special!) and suddenly I’m noticing everyone around seems to be “getting on” and ailing with this and that, humans and animals and me too. And I was always the relative youngster! I remember someone interviewing George Burns at ninety-something and asking the favourite, stupid reporter’s question, “How does it feel (to be such a great age)?” His reply, “Better than the alternative!” The more miles under the belt, the blacker the humour necessary! A beautifully written post, you absolutely nailed that poignant feeling. Beautiful, eloquent, and sadly true in a good sad, I wouldn’t trade it sad, sort of way. We found the papers on my rocket horse: he fooled all the vets who estimated his age. He’s going to be 24, not 18, in May. It’s just a number, but I’m glad to know. On days I’m exhausted, I think “I’m not going to get this day back, were going to do something together.” It will be good not to have regrets. Oh, how I wish I approached my senior mare with your sentiments. Instead, I busied myself with other project and things until one day I realized I’d let too many days slip by without doing much more than feeding and grooming her. She was perfectly capable of more time spent together on the trail. I shook myself out of my fog and we managed to get a handful of fantastic rides together before it was her decision to leave me, but oh how I regret not having just one more spring or fall season with her ….. Good words of wisdom here! I love your post and found great comfort in it. I currently have 9 four leggeds living with me; 3 each…dog, horse, cat, and 5 are in their senior years. My three horses are all beginning to show signs of fading…one is 42, one has had an old hip fracture for years that is currently challenging him visibly, and one has had everything under the sun since being diagnosed with cushings three years ago. Two of my three dogs are 18 and 15 this year, and showing clear signs they are on the final leg of this life journey. My 13 year old cat is showing no signs of imminent slippage, and i am so grateful for that! It is depressing some days, well, most days, and often a daily challenge to remember to cherish special moments. I am making a conscious effort to stop and be in the moments that ebb and flow each day when I am smiling or laughing with them, and not worried about what I am seeing. THANK you for sharing your story! It brings a sense of peace knowing others are experiencing the same journey. I am happy and sad for you all at the same time. Such long lives these animals have had, with someone who cares so deeply. Thank YOU for sharing, and I am wishing you and yours an early, warm spring. Thanks for your heartfelt comment.